A brand new expose by Bloomberg shines light on modern day loan sharks: city officials that are armed with badges like Vadim Barbarovich, who earned $1.7 million last year, easily giving him the most lucrative job within the government of New York City. His official title is City Marshal, and he’s one of 35 that the mayor has appointed to compete for fees from recovering debts. 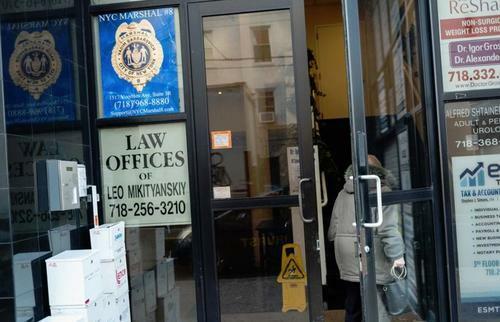 While traditionally marshals evict tenants and tow cars, Barbarovich has found his place in part of a debt collection industry that allows them to use their legal authority on behalf of predatory lenders. It’s a practice that dates back to the 17th century. Back then, jobs across the Hudson River for marshals yielded the highest fees. Under current law, marshals are entitled to keep 5% of cash that they collect. The city also has a Sheriff's office that does similar work, but those employees get a salary. Several mayors have called for an end to the marshal system over the last few decades, but nobody has been successful in getting the state legislature to act upon it. 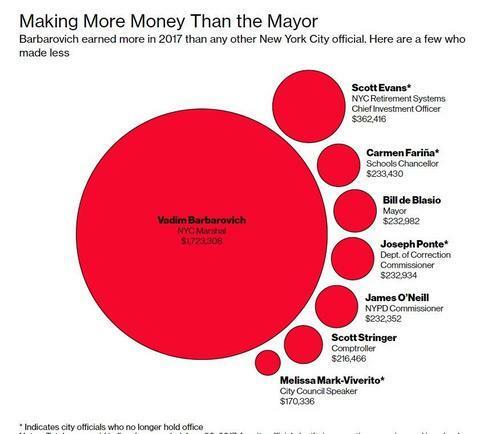 While Barbarovich's jurisdiction is supposed to end at city limits, he has worked to recover debts from places like California and Illinois, among others nationwide. 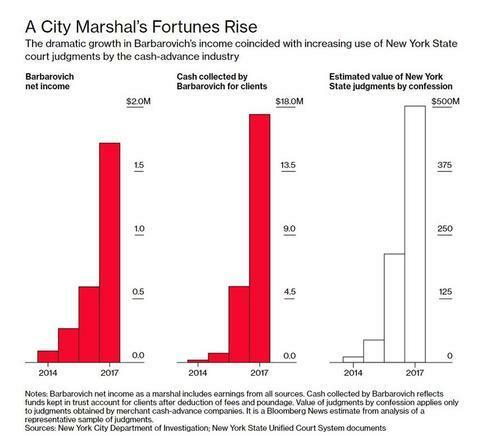 When asked about Barbarovich's practices, a spokesman for the New York City Marshals Association said that marshals simply "enforce court judgments". The genesis of these judgments are often lenders who advance money to people at rates that can sometimes top 400% annualized. They have found a loophole around loansharking rules by stating that they are instead buying the money that businesses will likely make in the future at a discounted price. Courts have been supportive of this distinction and, as such, the "merchant cash advance" industry has grown to about $15 billion a year. As soon as lenders see that borrowers have fallen behind they call marshals, whose job is to force the banks to handover whatever cash is left. They do this by using a court order stamped by a clerk that’s obtained without going before a judge. Banks generally comply immediately, without checking if the marshal has the right to actually take the funds. The borrower often doesn’t understand what’s going on until the money is gone. Prior to becoming a marshal, Barbarovich worked in property control earning about $70,000 a year and sometimes volunteered as a Russian translator. 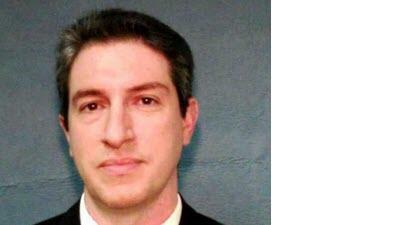 Upon starting as a marshal in 2013, he earned about $90,000. When cash advance companies discovered the power he had, his income skyrocketed and his earnings increased almost 20 fold. His financial disclosures show that his work enforcing Supreme Court property judgments skyrocketed dramatically over the last two years, as did the amount of cash he recovered. In some respects, the collection process is like the wild west: marshals don’t draw a salary, earn fees from customers and are encouraged to compete with one another, which can catalyze aggressive behavior. The Bloomberg article tells the story of Jose Soliz, whose company builds concrete block walls for schools and stores in the Texas Panhandle. He had started borrowing from cash advance companies several years ago and found himself trapped in a cycle of debt. He eventually wound up taking out a $23,000 loan that he agreed to pay back within nine weeks – to the tune of $44,970: an 800% annualized interest rate. He says that the fees were more than expected, so he stopped payment. When he went to go pay his employees a couple days later, he noticed that his Wells Fargo account had been frozen and his paychecks bounced. He found out the hard way that cash advance companies like the one he used required him to sign a document agreeing in advance that if there’s a legal dispute, the borrower will automatically lose, rendering any type of judicial review useless. Those who are signing these agreements don’t often realize the power that they are waiving. Based on these agreements, the lender can accuse the borrower of defaulting, without proof, and have a court judgment signed by a clerk on the same day. This is exactly what happened to Soliz. His lender obtained such a judgment against him in Buffalo, New York and called in Barbarovich to collect. Even though his Wells Fargo account was opened in Texas, and the judgment was only valid in New York State, the bank turned over $56,764 to the marshal. The rule is supposedly that marshals can go after out of state funds as long as they serve demands at a bank location in New York City, according to the New York City Department of Investigation. On the other hand, it’s not clear whether or not banks have to comply with these orders. Some banks reject these demands but most have a policy of following any legal order they receive so as to avoid the hassle of reviewing them and not to ruffle any feathers. Wells Fargo, when contacted by Bloomberg, stated that it "carefully review[s] each legal order to ensure it’s valid and properly handled." Barbarovich claims that he serves all legal orders by hand, though that is disputed by Soliz's lawyer. The Department of Investigation reportedly "continues to review" Barbarovich's work and offered few specifics to Bloomberg. The Department has stated that they’re conducting multiple investigations into the enforcement of judgments and focusing on whether not marshals are serving orders by hand.